Limited edition of 801 pieces. Launched in January 2010. Jaime Zobel was commissioned by Swatch Philippines to create a watch that would pay tribute to the late President Corazon C. Aquino. 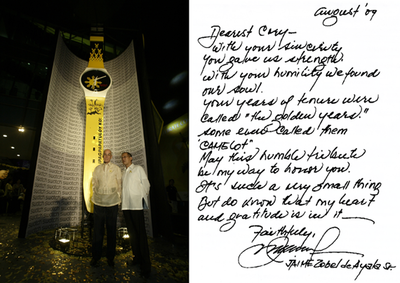 Before sketching his watch design, Jaime Zobel wrote a letter of gratitude to President Aquino. The letter is reprinted in the book that comes with the limited edition watch. Book text written by Congressman Teodoro Locsin. Design of the Cory swatch: Yellow strap bears a sketch of Cory and Ninoy Aquino on one side. The other side has the yellow ribbon identified with Ninoy and Cory Aquino.